Premium Compatible Label Tapes for the Brother P-Touch 1010 printer. Brother P-Touch 1010 is a handheld label printing machine catering to all kind of labeling requirements at home or office. Brother P-Touch 1010 is a compact unit weighing about 365 grams and is powered by Six AAA batteries or an AC adapter. Brother P-Touch 1010 unit comes with a Tape Cassettes, batteries and cutter unit. Brother P-Touch 1010 prints 3.5, 6, 9 & 12mm labels, the total tape length is 4 meters. Brother P-Touch 1010 Label Tapes are TZe laminated tapes and tested positively against water, sunlight, chemical resistance. Brother P-Touch 1010 features one font, eight character style, three character size (large, medium, small), 83 symbols, six frames and six built in auto formats. There are separate number keys and alphabet keys. There are time and date option for labeling dates on items. The device stores a label memory of 9 favorite labels. Brother P-Touch 1010 is a product on the go device. It is suitable for all age group. Children can use it to label their stationary, projects and school items, homemakers can use it to label day to day household items both indoor and outdoor and offices can use it to label work files, folders, and shelves. The laminated quality tape makes the labels everlasting. Date and time labeling can help in labeling food and leftover items. Q. Can the Brother P-Touch 1010 handheld device really create durable prints on Brother P-Touch 1010 label tapes or are other types of machines better for printing? A. Yes, this handheld label printing device is adept at printing label tapes and deliver best results. It is as good as any other machine for printing label tapes of your choice. Q. How many print styles does Brother P-Touch 1010 yield? A. It produces nine print styles. Q. Are Brother P-Touch 1010 label tapes available in different colours or just black and white on clear background? Can you give me an idea about some colour options provided for these tapes? A. These label tapes come in a variety of colours and their combinations besides black and white. You also have the option of printing your matter on clear background as well as colours such as green, yellow and even black. You can also opt for gold on black printing option if you want to give a special touch to what you’re going to label. Satin gold and berry pink are some more eye-catching instances you could experiment with. Q. Will 9mm size of these tapes be suitable for easy reading and clarity? A. Yes, it is ideal as easy-to-read size. Q. Can I get a text preview of what labels I’ll print look like before printing? A. Yes, you can get a text preview on the LCD display of the machine before taking prints of the labels. Q. Are Brother P-Touch 1010 label tapes provided with lamination? Can I use these label tapes in my lawn that sees a lot of moisture and snow for a significant part of the year? A. Yes, they are made with special laminate process that makes labels durable enough for indoor and outdoor use. Since they are laminated, you can certainly use these label tapes in your garden and be sure that they won’t be smudged no matter how much it snows or rains. 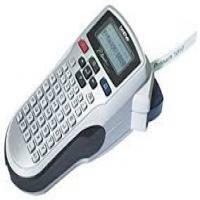 Q. I recently bought Brother P-Touch 1010 handheld label printer. I read that it uses thermal transfer tape technology. I wanted to know if this feature allows the device to print high quality, durable labels that can withstand varied weather conditions or not. A. Yes, thermal transfer tape technology is widely known to produce results that last long in extreme weather conditions and even exposure to chemicals. The processes used in printing anything, including label tapes in this technology ensures that ink is embedded deep into the material with heat. You can go ahead with printing labels that last you really long with this label printer. Q. Is Brother P-Touch 1010 label tapes suitable for wire wrapping? Q. Would you recommend settling on Brother P-Touch 1010 label printer for my printing work load that’s always heavy? Does it offer competent features and functions I can rely on? A. Yes, you can choose the Brother P-Touch 1010 label printer as it is designed to cater to a vast number of label printing needs. It is a handy, portable device which you can carry anywhere conveniently. It boasts of a two-line printing feature and a large 12-character LCD display for easy viewing. You can choose from eight different type styles and three type sizes. It can print on several types of label tapes and yields print results that last really long. Q. Do Brother P-Touch 1010 label tapes offer different adhesive choices for printing labels? Does it offer extra strength adhesive power too? A. A wide variety of adhesive choices is available for this label tape. You can put up the labels printed by this machine just about anywhere and be sure the labels will remain intact and not come off.